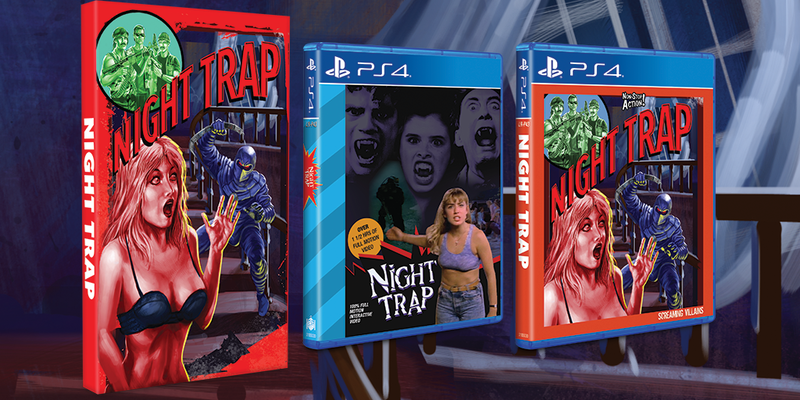 Limited Run Games has announced that Night Trap will go on sale on August 11th, 2017 in two batches. The first batch will go live at 10 AM ET and the second at 6 PM ET. There will be two different editions up for grabs that day, a standard edition and a Collector’s Edition. The Collector’s edition will be limited to 3000 copies, while the standard edition will be limited to 5000 copies. -Region free Night Trap physical disc for the PlayStation 4 featuring a full-color manual, large fold-out poster, and reversible cover art. -Night Trap cassette tape featuring the infamous Night Trap theme song. -A 4-inch custom embroidered Special Control Attack Team patch on black ballistic fiber. -An individually numbered shrink-wrapped box specially tooled and tailored to be a throwback to the original red box Sega CD release of Night Trap. The standard release of the game will include a full-color manual, large fold-out poster, and reversible cover art. They also have a Sega 32x cover for their rewards program available.